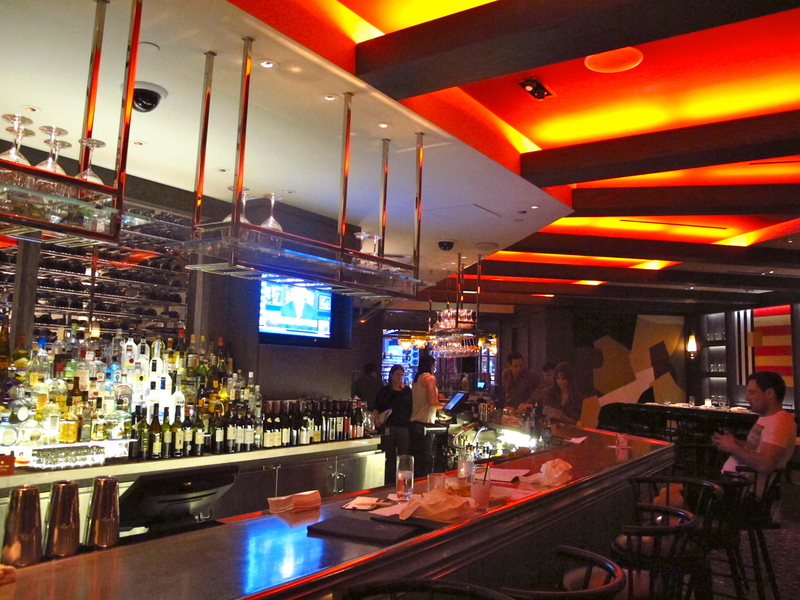 I found myself in Las Vegas recently, and in between bachelorette parties, black jack games and tanning time I did manage to visit some great restaurants and bars on the Strip. As you all know my blog revolves primarily around Los Angeles, however I thought it would be a good idea to put up other States and Cities when I visit them, in case you ever find yourself in those neighborhoods also. The first spot I want to talk about, I didn’t actually make it to on this trip but is certainly worthy of mentioning for the Mixologists and real drink enthusiasts. 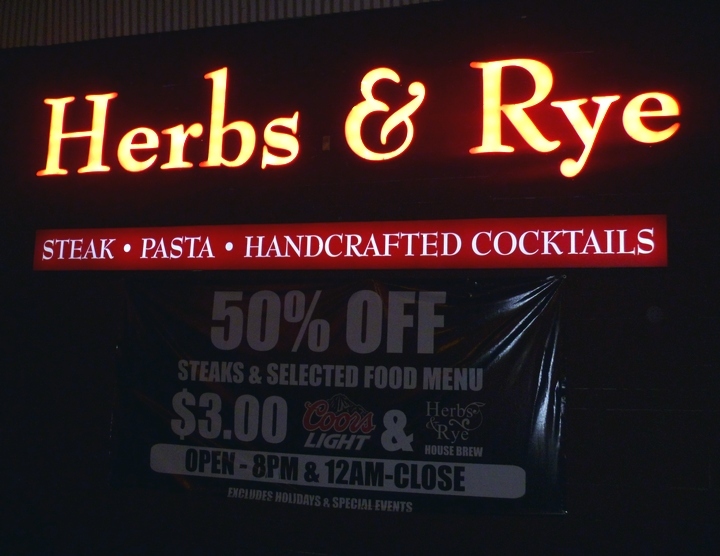 I thought it would be hard to get a decent cocktail in Las Vegas seeing as the slushy type margaritas and lava flows are usually in full force, but the bartenders at Herbs and Rye proved me wrong. This bar is a great place to get a pre-prohibition style cocktail, the service was friendly and the drinks were all made perfectly when we went. The drinks we tried (Aviation and a Whiskey Sour) were balanced and flavorful. The menu gives an array of options listed by the periods in time in which they were created (pre-prohibition, 1800s, Golden Age etc) each drink with a little description of it’s history underneath. If you want a speakeasy style bar on your next trip to Vegas, definitely head here. We had a really great meal at Sensi within the Bellagio. My boyfriend (FutureGreg) and I split a 140z Rib eye steak, a side of truffle mashed potatoes and a portion of bloomsdale spinach with caramelized onions. It was an expensive restaurant but splitting the meal was more than enough food and about the same cost as if we’d got our own meal somewhere else. Service was great, and they gave us delicious naan bread and crackers to start with which was a fun and interesting alternative to a traditional bread basket. The bloomsdale spinach is a thicker and heartier leaf compared to other variations so it had a lot of flavor in itself and I didn’t think needed the caramelized onions at all. The mashed potato was just divine; creamy, rich but not an overpowering truffle flavor. It went beautifully with the tender cooked steak. I didn’t try any drinks here but the food we had was fantastic and the ambience was nice, very clean and inviting. I could probably write a two page spread on this bar’s decor alone. Stunning crystal curtains hang from the ceiling and drape down 3 floors in the center of the Cosmopolitan Hotel creating the illusion of a massive chandelier. 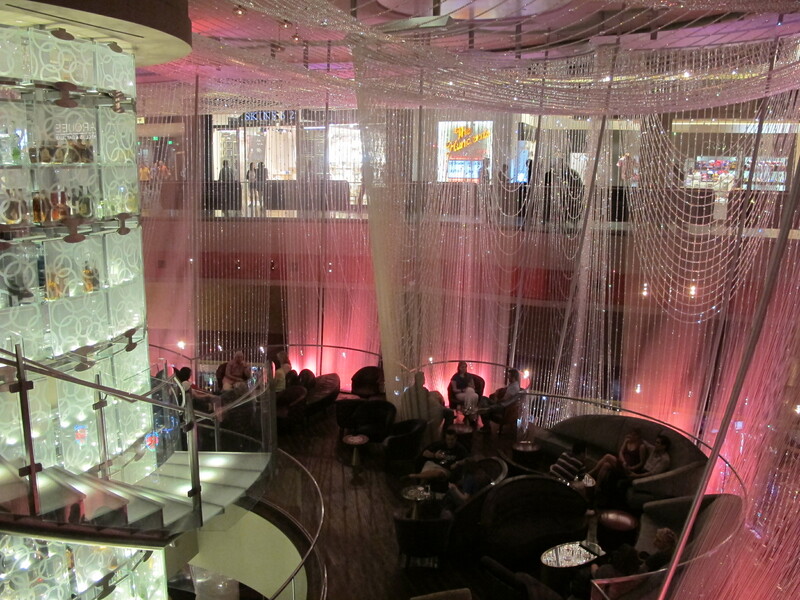 The bar in the center of it, named appropriately ‘Chandelier Bar’ is equally attractive and the entire space is drowned in beautiful pink/purple light. It was just so romantic and gorgeous to walk past that I knew we had to stop in and get a drink. I tried the Blue Grass Shuffle and FutureGreg had the Spiced Apple Jack. 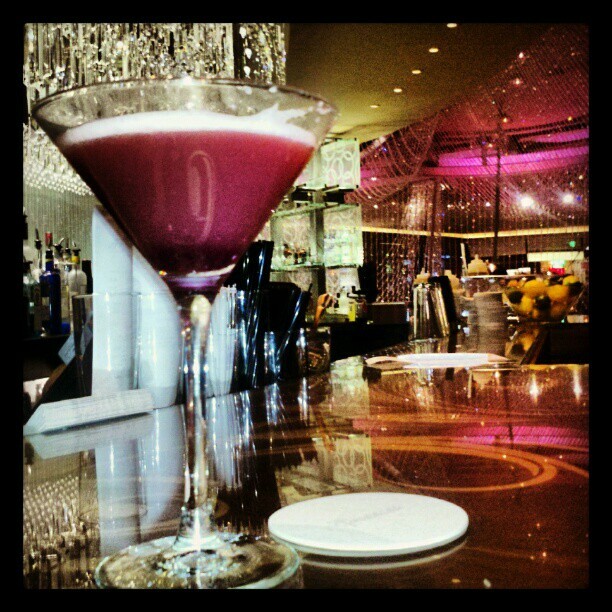 Mine was fruity, strong and flavorful with a gorgeous magenta color that fit in with the pink hue of the room. It had blueberry jam (jelly) flavor from the preserves and was a drink that would definitely be great in Autumn. The egg white was barely noticeable but gave a light foam on top, all in all a good drink and pretty strong. The Apple Jack drink was sweeter than mine but interesting and again with more ‘Autumn’ flavors to it, which is odd seeing as we’re already in May and clearly in to Spring. The Rosemary had a strong presence in the drink but the balsamic reduction was hardly noticeable. The service was ok, although the bartender didn’t seem overly attentive or personable. 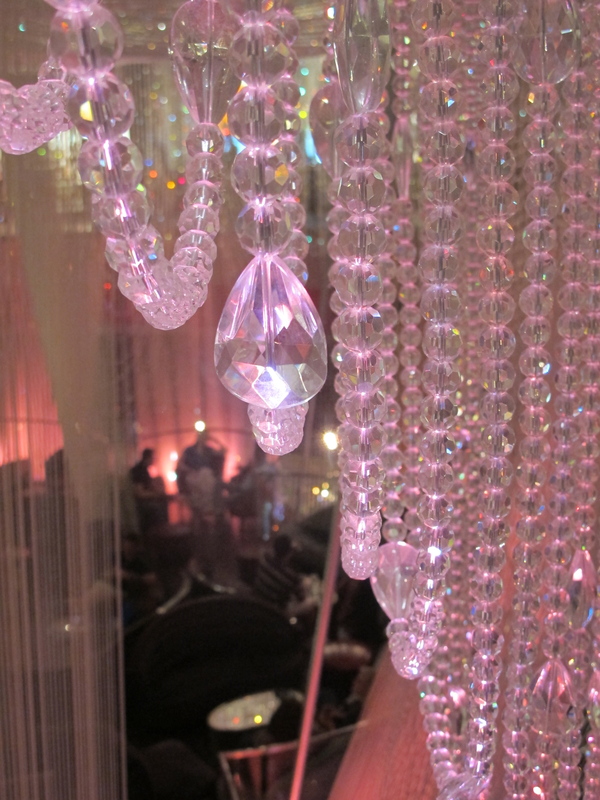 The drinks were good and the ambience being surrounded by crystals made it worthy of a visit. Having been to the Los Angeles location just a week previous I was curious to see how this Vegas version measured up. It was almost completely empty when we arrived, which concerned me at first, but with 4 other restaurants (including STK) beside it, its understandable that competition is high. We started with some drinks and I ordered a ‘Vegas High Rise’ which was created originally by Tony Eppolito, which was refreshing, sweet and very good. We started off with a salad that was good but nothing special. I’d never had a salad with hazelnuts on it before and think I found them to be too strong of a flavor for the dish, I prefer other nuts like almonds or walnuts on my greens. The goats cheese was yummy though. We ordered yet another steak (we do love our beef) and the sides of Macaroni Gratin with blood sausage and the Beer Cheddar Grits. The Steak was excellent and had chunky fries with a delicious aioli on the side. The Mac and Cheese was absolutely fantastic, FG and I love a good Mac and Cheese in general but this was one of the best versions i’ve had in a long time. It was cheesey, creamy and rich with a strong flavor from the meat pieces. The baked panko breadcrumbs on top finished it off perfectly. The only part of the night I found disappointing were the grits. They came in a cute little saucepan and I was excited to try them, but there was way too much beer in the mix and I felt it overpowered the entire dish. I don’t recommend them. Overall I liked the dinner at Comme Ca and would happily return for another meal there, especially for that Macaroni Gratin. The drinks were fine and there were a decent selection of classic cocktails as well as new creations on the menu. We were only away for a short break this time so the above is by no means a comprehensive list of places to go in Las Vegas, merely a selection of the restaurants we enjoyed on this particular trip. 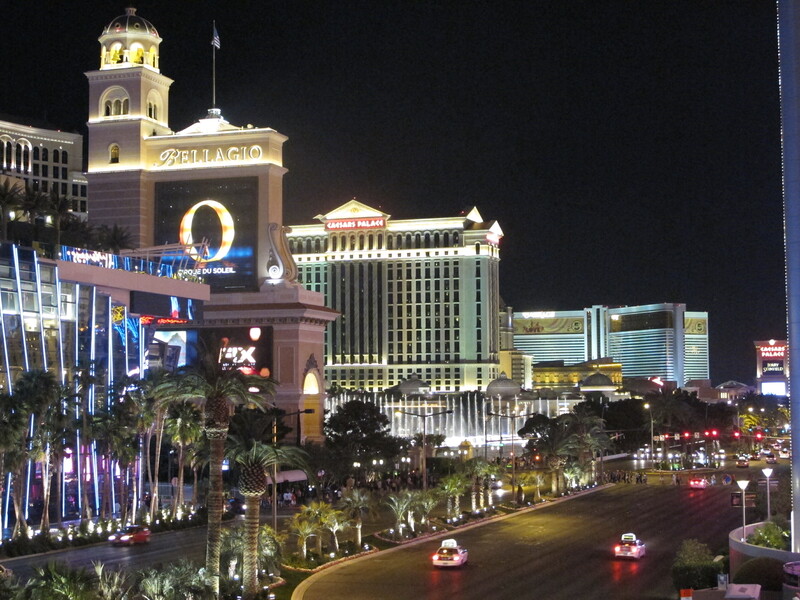 I will add more when we next return to Nevada, but if you ever find yourself in Sin City I definitely suggest trying one or more of these places.